In Ayurvedic medicine, the way one prepares milk has everything to do with how our bodies react to it. 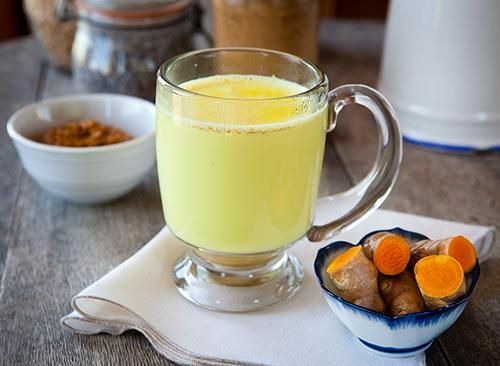 To prevent bloating and allergies and maximize the health benefits of dairy, Ayurvedic practitioners brew golden milk, a blend of milk and turmeric. Turmeric has been shown to act directly on the genes that control fat storage, while the calcium in milk is linked to lower body mass—a University of Tennessee study found that dieters who consumed between 1,200 and 1,300 mg of calcium a day (about four cups of milk) lost nearly twice as much weight as those getting less milk. Golden milk is used to in Ayurvedic medicine to improve joint pain, muscle stiffness and to boost the immune system. No wonder yogis have such amazing flexibility! How to Enjoy It: Mix one cup of milk with ¼ tsp of turmeric, and bring to a boil. Sweeten with a touch of honey.